This recipe is SO GOOD! I used frozen hash browns instead of chopping potatoes, and I added a cup of chicken broth to make it go a little further. I will definitely be making this again! this is fantastic ! Thanks. And this is first time I have thickened with flour this way without adding milk to the flour. This worked SO much better!!!!! Thanks!!! I doubled the hamburger and seasoned it with a blend of spices and simmered it in mustard after browning, added bacon, used real sharp cheddar cheese instead of velveeta and used 2 parts heavy cream 1 part milk. My family loved it and everyone had seconds. I also added Sriracha to my personal servings for some extra kick and it was great! I want to make this tonight for dinner how would I make it in the slow cooker??? I have made this several times in the last few months and always get rave reviews. It is super yummy. Made for school and doubled and that filled my crockpot to the top. Thanks! Made this tonight for supper, and all I can say is…YUM! Loved it. i made it & it was awesome. I had 2 double it because I cook 4 a lot of people & I took some 2 work & they loved it as well!!!! this is a family favorite! I sub ground chuck and add bacon…yes, not healthy, but delicious! Thank you for sharing! Found this on Pinterest, and can I just say…thanks so much sharing for this recipe…it was incredibly delicious (I used the 2 cups of shredded cheddar). Will be making it again for sure!! Made this for my family last night and everyone (right down to my picky 2 year-old) loved it! I used 2 cups of shredded pepper jack cheese instead of Velveeta – Delish! Thanks for a great recipe! Made this for dinner on a ridiculously cold night. My picky eater loved it. And so did everyone else. Very comforting and healthy, too. Loved using the shredded Cheddar. This soup is AMAZING!!!! My husband and daughter request it every week and it makes enough for two dinners so that’s saying something! I have shared this recipe with several friends and they all absolutely loved it too. If you haven’t made it yet, DO IT! Thank you so much for the recipe. I was in charge of finding a soup for a competition at my child’s high school and came across this one. We were looking for something different than the 5 recipes others would all use. We were told to make enough for 100 people to have small samples and instructed not to even go that high, there was a lot left over last year. I tweaked the recipe here and there ( I can’t seem to help myself!) and passed it out to 4 others so we could all make the exact same thing as per the instructions. People at the event looked as us weirdly and at first avoided our table because of the name. There were some kids who hadn’t bought tickets to the event but were there, so I gave them samples anyway. They were quick to pass the word to their friends who in turned passed the word to their parents. We suddenly had people swarming the table saying they’d heard about our soup and had to try it! We had started out with 5 full crock pots and ended up with everything empty and winning the competition. 🙂 Awesome recipe! Delicious soup… my hubby and I loved it! I did 1/2 Velveeta and 1/2 sharp cheddar cheese. Was wondering if this would freeze well? There are only two of us! Very good soup. I added salt a few times while cooking to help with taste. We also used deer meat, if using that only 1/2 pound. If this is your idea of insanely delicious, you need to get out more! This soup is just ok. Lacks seasoning / taste. My family expected better from the reviews, definitely sounds better than it is. Even if this is your opinion… why on earth would you write such a negative comment like this? Is this supposed to make me feel good? Try writing a positive comment and making the world a better place. And read all of the comments, I am not the only one that thinks this soup is the best… and its the most popular soup on my site for a reason. Sorry if my opinion made you feel bad, but it’s just an opinion. My comment that this soup lacks seasoning / taste is not making the world a bad place…..it’s informing other people that it may need adjusting according to my family’s taste. I did read all the reviews, which is why we decided to try it. It’s not horrible, nor did my family think it was insanely delicious, we just expected it to more than just ok. I agree. It was just ok to me and my hubby. I was looking forward to this dinner! I just wish it tasted as good as it looks, unfortunately it doesn’t! I did everything the instructions called for, but it tasted TERRIBLE! The ingredients contain too much salt, so it consisted of a dog food taste. Very disappointing! Oh my goodness I am so sorry you didn’t like it! 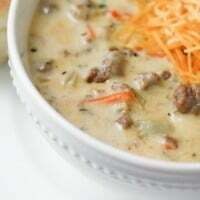 This is one of our favorites and most popular raved about soup recipe on the blog. Made this soup tonight for my husband & son. Just a few things… I found that the butter/flour ratio for the roux was off. Traditionally, a roux is equal parts fat & flour. I had to add an additional tbsp of butter to even out the ratio & undo the ball of flour that formed in the pan. Also, I’d definitely recommend using a much bigger pan. The 3 qt. saucepan was ok until the cheese & milk were to be added. Fortunately, I’m fairly messy & I anticipated overflow & transferred to a stock pot. Added about 2 tbsp. garlic salt & some extra ground pepper for our taste. Also, I saw other comments mention the cheese on the top & no mention of reserving a bit for the end. Fortunately, being a cheese-loving Wisconsinite, I had plenty on hand. Overall, a really tasty soup & will make it again. I am preparing this soup to be served later tomorrow. Is it ok to go ahead and add the sour cream a day before seving?? I made this soup tonight for our pre-Super Bowl meal. It was absolutely AMAZING!! I have very picky eaters and everyone had at least two bowls each!! Award-winning recipe, no doubt!! Thank you for sharing!! Delish! Wonderful recipe!! OMG this was delicious! Thanks for sharing! The third time was a charm for me with this recipe. This time I used frozen carrots, and 4 cups of frozen Southern Style Hashbrowns. I’m pretty messy in the kitchen, and using frozen pre-cut ingredients cut my prep time in half, and clean up a lot easier. Thank you for a great recipe! This is way good! Made it tonight for dinner and it was just amazing! Added some ketchup and mustard and it really made it better! Next time I’ll add some bacon bits! This looks delicious. I’m definitely going to make it. Thank you for the recipe. I’ll make it as posted first. Then, when I go to visit my daughters, who are mostly vegan, I will want a vegan option. Do you, or does anyone, have any suggestions? I can use veggie broth and veggie crumbles. Use almond milk, unless someone has a better suggestion. Then, I just need to figure out what veggie cheese would be good. My only other problem is that the weather is not cooperating, It’s the end of September and is in the 90s today. Over a 100 last week. Ugh. Come on cooler weather. =) Thanks again. I’ll to come back to rate it. Been making this one for my husband, friends & family for years. Got the recipe from Taste of Home. Usually make a double batch and there isn’t a bite left! I am going to make this tonight and reading all the comments, which cheese is best the velveeta or the shredded cheddar cheese? Didn’t have any carrots or celery or sour cream, but wow, I love the taste! I have made this twice now cuz my family loves it. Thank you for this recipe! Can I use red potatoes? It’s all I have on hand today! Hi Susan! It actually isn’t too bad! Here are the nutrition facts: 1 serving (1 cup) equals 330 calories, 18 g fat (11 g saturated fat), 59 mg cholesterol, 1,027 mg sodium, 26 g carbohydrate, 2 g fiber, 15 g protein. So, I’m thinking, who only eats 1 cup of soup? Little kids? I would eat at least 2.5 cups, which is a whopping 2.5 grams of salt, and 45 grams of fat. You might as well eat a sirloin steak, you’d have less fat and less salt, and none of the chemicals from the Velveeta. This recipe, I’m sorry, is junk food. Apparently no one cares what they put into their bodies anymore. Crack cocaine is probably at least as popular as this soup, but neither are good for you. Thumbs down. Top each serving with a handful of chopped lettuce and tomato!! It makes it and adds freshness. I also add some banana peppers on top! Just wanted to let you know I just found this recipe and made it tonight for dinner! Great hit with the Husband! Love it!!! Loved this! And been asked to make it again…Sooo tasty ? 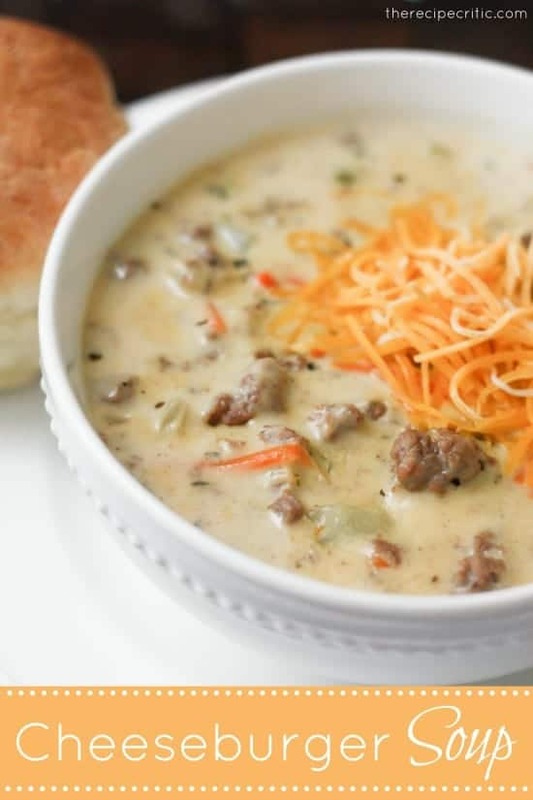 I’ve made cheeseburger soup before that my family said was “just okay”. I decided to try again and found your recipe which we all loved! I used about 2 1/2 cups sharp cheddar, grated (measured loosely packed in cup) which worked out great. I had leftover potatoes and carrots from a sheet pan meal that were already seasoned with dry ranch dressing and some Italian seasoning as well as salt, pepper and parsley so I did not use the basil and parsley listed in the recipe. I used Better Than Boullion for the chicken broth and made a cheese sauce to add in at the end which I found to be easier. The only thing I will do is to use mashed potato flakes to make it a little thicker to suit our tastes next time. Thanks for a great recipe! I’ve seen variations of this soup circulate around Pinterest for some time and I finally decided it was time to make it… and it was delicious! Nothing in this soup screamed cheeseburger to me except for the fact that it did have cheese and ground beef in it, but I’m not complaining! It’s super easy and made with ingredients I usually have around the house! Delicious!! A family favorite and easy to make! Very good soup really enjoyed it.